Early home of the Karankawa Indians. Landing place of LaSalle in 1685. Settled 1822-1836 by colonists of Stephen F. Austin. The municipality of Matagorda organized under the Mexican Government on March 6, 1834. 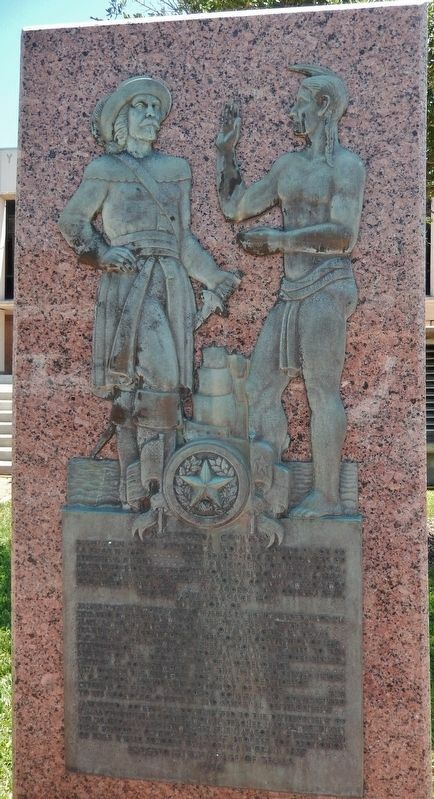 Became on March 17, 1836, Matagorda County, which was organized in July 1837. 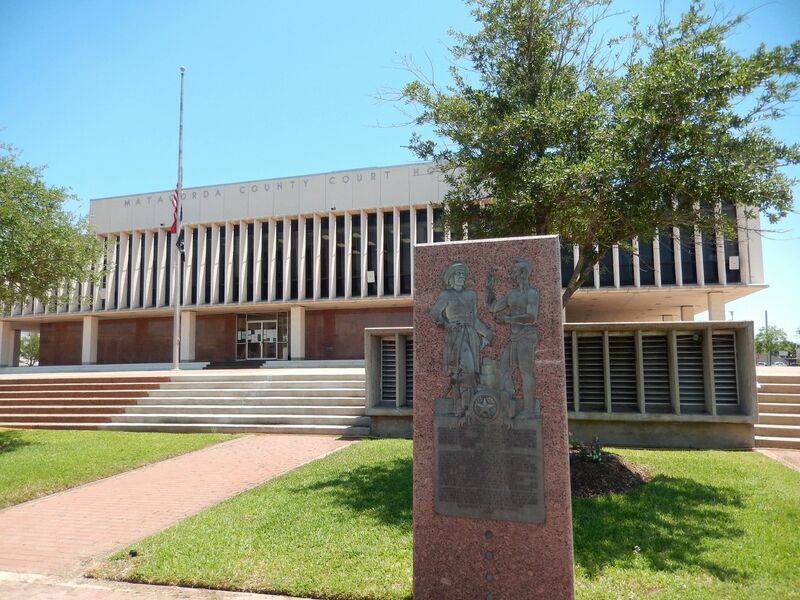 Matagorda, was the county seat, 1837-1894, Bay City since 1894. In Memory of James Cummins, Hosea H. League, Elias R. Weightman, Seth Ingram, Horatio Chriesman, William Selkirk, early settlers. Mary S. Wrightman Helms, the first woman teacher in Texas. Ira Ingram, Silas Densmore, members of the Convention of 1832. R.R. Royals, Ira L. Lewis, Charles Wilson, Delegates to the Consultation. Bailey Hardeman, Samuel Rhodes Fisher, signers of the Declaration of Independence. George M. Collingsworth and the men who served under him during thr struggle for Texas Independence. A.C. Horton, Lieutenant Govenor of Texas. The citizens of early Matagorda County who contributed to the economic, cultural, and spiritual development. Helms,1829; an early newspaper The Matagorda Bulletin, 1837; First Episcopal Church, 1839; first request for promotion of free school, that of Ira Ingram, 1837. Location. 28° 58.972′ N, 95° 58.178′ W. Marker is in Bay City, Texas, in Matagorda County. Marker is on 7th Street (State Highway 35) east of Avenue F (State Highway 60), on the right when traveling east. Touch for map. 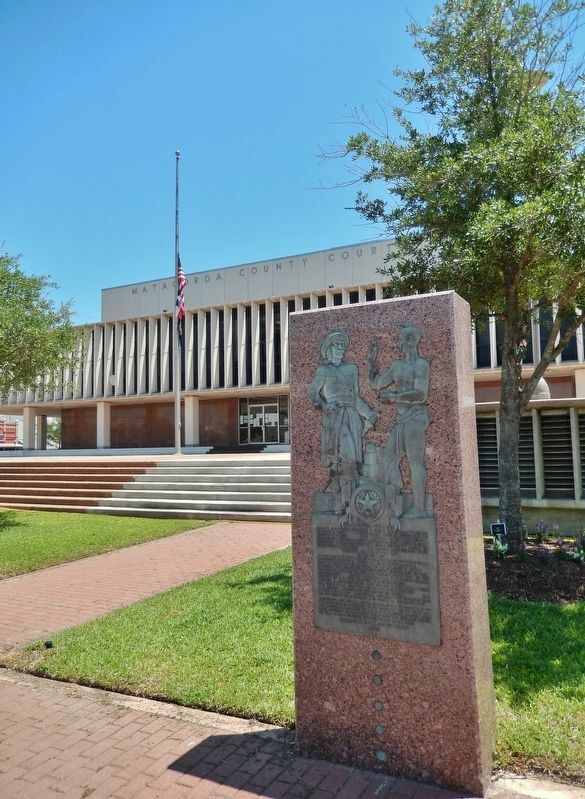 Marker is located beside the sidewalk, in front of the Matagorda County Courthouse. Marker is at or near this postal address: 1700 7th Street, Bay City TX 77414, United States of America. Touch for directions. 300 feet away, measured in a direct line); Matagorda, C.S.A. (about 300 feet away); Bay City Library (approx. 0.2 miles away). Touch for a list and map of all markers in Bay City. More about this marker. Marker is a large metal plaque mounted on a large, 5-foot tall polished granite monument stone. Top half of marker features a bas-relief sculpture of Robert de La Salle and a Karankawa. Marker is significantly weathered and difficult to read. Credits. This page was last revised on July 24, 2018. This page originally submitted on May 17, 2018, by Cosmos Mariner of Cape Canaveral, Florida. This page has been viewed 94 times since then and 12 times this year. Last updated on July 24, 2018, by Brian Anderson of Kingwood, Texas. Photos: 1, 2, 3. submitted on May 17, 2018, by Cosmos Mariner of Cape Canaveral, Florida. • Andrew Ruppenstein was the editor who published this page.